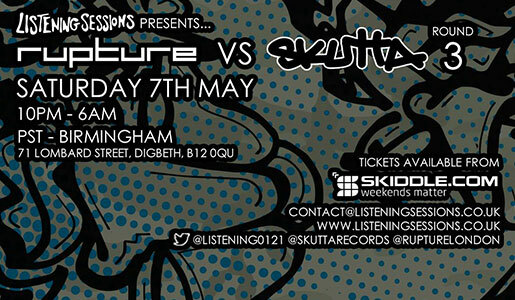 We are working with our friends at Skutta records once again to bring the heavyweight sound of Rupture to Birmingham for a night of junglist pressure at Club PST Digbeth! We’ve got 90 minute sets from both the 31 Records boss man and true pioneer, Doc Scott, as well as from Sully, no stranger to Listening Sessions and one of our most well-received Listening Sessions LIVE guest to date! Also on the night – Listening Sessions regular Rondema, Italian import Future Roots, 31 Records signing Jaydrop and Rupture’s very own Double 0 and Mantra & Djinn. Listening Sessions will be keeping the rooftop lively with a selection from Birmingham’s best home grown music – a mix of genres and styles and that family vibe we are known for! Local collective Circular Jaw will be hosting the basement, bringing with them a range of the cutting edge, gritty bass music that they are quickly earning themselves a name for. All in all it’s set to be another great event – if you’ve been down to the last two, you’ll know that this really isn’t one to sleep on. Tickets are available from Skiddle here!